Have a Roku streaming device? Cool. Now have a movie or TV show you want to watch, but don’t know whether it’s on Netflix, or Amazon, or Hulu? Well, I’ve got good news for you, as Roku has just launched a universal search feature, which will help you discover content available across some of the more popular video services available on its streaming set-top boxes. The availability of a new, universal search option will help to solve a major problem that exists not just on Roku, but on most devices capable of streaming video from multiple channels or apps. That is, when faced with hundreds of thousands of pieces of content across multiple services, it’s nearly impossible to know where to find a single piece of content. And in the case of Roku in particular, going into one channel to search for a piece of content — only to not find it — can be a frustrating experience, thanks to the overall side-scrolling UI and lack of a keyboard on its remote. Other streaming devices have solved for the search issue in a few different ways. In the case of the iPad, there are now universal search and discovery apps, like Fanhattan or Dijit’s NextGuide, which collapse multiple streaming services into one easy-to-navigate interface. And with the availability of new video services, Microsoft recently rolled out a universal search function for its Xbox Live service. In Roku’s case, the new Roku Search channel will peer into some of the most popular apps available on the device, including Netflix, Amazon Instant Video, Hulu Plus, Crackle, VUDU, and HBO GO. In addition to searching for a movie or TV show title, users can also search for available titles that include specific actors or directors. Once you’ve found a title you’re looking for, you can see which services a piece of content is available on and choose between them. 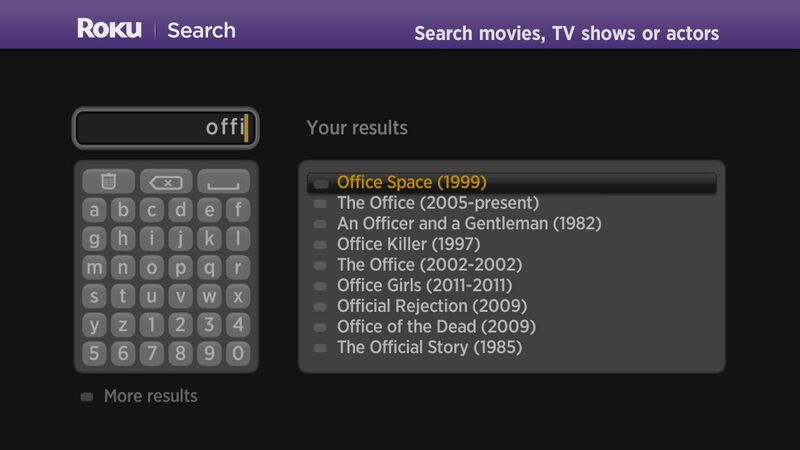 I played around with the new Roku Search feature and found it a welcome change to the old way of finding anything on the Roku device — i.e. endlessly poking around. But, to be honest, it’s still pretty clunky due to the general Roku UI and the way you have to scroll through and click letters to search on the screen. Roku says that there are more than 130,000 titles searchable through the new channel, as well as nearly 100,000 actors and directors. Roku Search will work with all Roku 2, Roku LT, and new Roku HD players, as well as the Roku Streaming Stick. And users of the Roku iOS and Android mobile apps will be able to access the keyboard through those apps, eliminating some of the up-down-left-right issues scrolling through letters on the device. 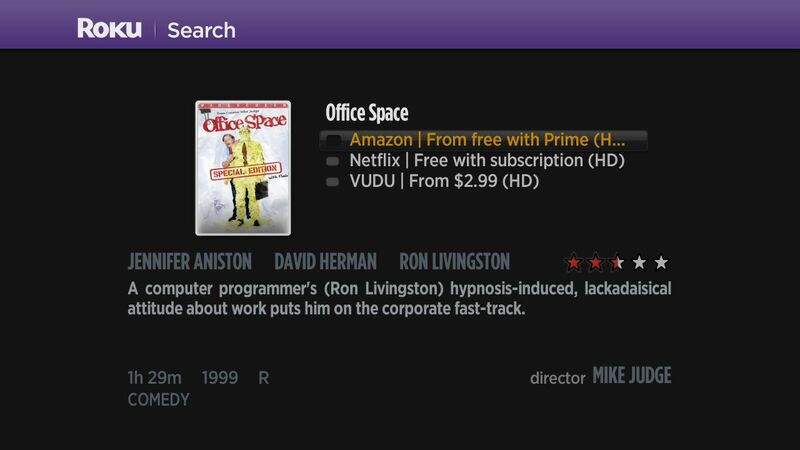 Roku Search became available as part of a free update that the company will push to users over the next week. Or, if you’re impatient, just go to Settings, choose “Software Update,” and the streaming box should update to the latest version and install Roku Search via channel code.